LayoutVision (formerly Model Rail Services) is Byron Henderson's custom model railroad layout design and operations planning service. The blog includes design and operations concepts, ideas, and opinions, as well as updates on current custom projects. 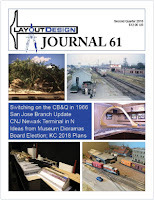 I mentioned my Model Railroad Planning 2019 article on designing switching layouts inspired by Clackamas, Oregon in both HO- and N scale for two different clients a few weeks ago. In that post, I noted that a friend was independently planning a 2-rail O scale layout for the same area. I had a little time, so I proceeded to sketch up something to fit his roughly 16’X20’ space. He’s building with sectional track and benchwork sections (mostly 2’X4’), so that added a little complexity to the task. (Not to mention the demands of the large scale in terms of siding and spur length.) But he and I were happy with the results. He needs occasional access to closets along the bottom edge of the drawing by rolling away the benchwork sections, so I tried to incorporate smaller track sections at those joints that could be easily removed and replaced. I gained some flexibility by wrapping the runaround along three walls. And the long, narrow strip of benchwork on the right wall was great for extending the main lead and imagined connection to Portland. As with any design for a larger scale in a relatively small space, arranging things so that the larger industries may be represented by flats keeps down the square footage demands. He indicates that he might swap the designations of the two Fred Meyer tracks to allow the bakery to be the longer track where a variety of car types might be spotted (hoppers of flour, tank cars of oils or sweeteners, box cars for packaging, etc.). He may make additional revisions as he builds, but this gave him a good starting point for his design. I can’t remember ever designing three layouts in three different scales for the same real-life location. But it’s been fun! It was interesting to explore a number of topics from a different perspective in LDJ-63. Although I personally don't have the modeling or photography skills to approach art with my own work, I'm happy that others do—and are willing to share! This issue includes: Stepping out of the Sandbox: Lance Mindheim on model railroading as art. John Sethian builds O Scale scenes inspired by Edward Hopper paintings. Multi-deck layout retrospective and lessons learned for large HO proto-freelance layout. Rethinking successful San Francisco State Belt HO layout in half, and double, the space. Portable banner helps tell Hawaiian Fn3 layout story. More design lessons from museum dioramas. LDSIG News and Announcements, including LDSIG activities at SLC NMRA 2019. I personally particularly enjoyed Bill Kaufman's article on what he would do differently with his mid-sized San Francisco State Belt layout if he were to build it in half—or double—the space with the same scale, era, concept, locale, etc. I hope we'll be able to publish more of these articles by other successful layout builders. To download a free “Sampler” of a few pages of LDJ-63 and other recent issues, visit this link. To begin or renew Layout Design SIG membership, visit this link. Paper copies are in the mail now, on-line-delivery emails will start going out in the next week or so. I always enjoy working with Editor Tony Koester and Kalmbach in publishing one of my custom layout design projects in Model Railroad Planning. This time around, it was actually two layouts – both based on the same area of Clackamas, OR in the 1990s. The first client was looking for a basic HO layout for this specific industrial area served by the Southern Pacific to fit some on-hand pre-fab sectional benchwork. The layout was set to occupy a fairly restricted space, so while we were able to add one more section, things were tight. The second client inquired a few weeks after that project was finished. He wanted an N Scale switching layout located somewhere in the west to operate a wide selection of ‘90s SP-and-kin diesels. Bloody Nose, Speed Lettering, Kodachrome, etc. I described the previous HO project, just as an example of the kind of thing we might do. No need to look further, he decided, and so Clackamas was redone in N scale. Better artwork and more details are found in the MRP article, which is part of another great overall issue. Download a .pdf of this image here. Coincidentally, a friend who lives near the modeled area had decided before the magazine was published to build a layout of the same industrial area – but in two-rail O Scale! He’s already on his way to a track plan, but I might be able to make a suggestion or two. It’s a three-fer! When I started layout design and ops consulting in 2004, I knew that I needed to appear on the web. I was in a hurry, so choosing my email ISP for my web hosting for convenience’ sake was the path of least resistance. After all, I only expected to need about six or eight pages – how big a job would it be to re-do it later? Yeah, about that. 60+ pages later, it’s a huge job. Over the years I’ve added topics of general usefulness for folks (I hope), as well as examples of custom layout designs for clients. The creaky and arcane tools I started with in 2004 never really got much of an upgrade. And recently, my previous ISP announced they would be shutting down the tools, which would delete my site. It’s probably for the best. The previous tools had been balky and not remotely easy-to-use for the last five or so years. Not to mention that nearly 40% of the recent visits to my site are coming from phones and tablets rather than traditional browsers. My old site did a poor job of accommodating these visitors. The new tools I am using allow better interfaces for these devices, although I have not yet tweaked every page for best appearance. But the most-commonly-visited pages should be better for mobile users now – and I will get to the rest over the next few weeks. Because of the arcane limitations of the Year 2000-era tools, web addresses (URLs) for my previous site were non-standard. That means that the addresses of content have changed on the new site, but nearly all of it has been recreated somewhere on the new site. It was painful to give up a decade-and-a-half of others’ links to my content, but it’s the price of existing in the current millennium. Another consequence of retirement of these tools is that my personal web pages on the Oakland Harbor Belt layout concept will also disappear. But I’ve moved on to a new concept (more on that later) and I have archived the OHB content to make it available in some form sometime in the future (as if anyone is interested!). When the numbers of visitors to layoutvision.com started to grow quickly in 2008, I began paying closer attention to visitor- and page view counts. Since the beginning of 2009 my site has served over 3.5 Million page views. Not bad for a site that just started out as hanging out a consulting shingle in cyberspace. So thanks for your support and interest over the years, and I apologize for the inconvenience of lost URLs. If you would like to link to my content again, I encourage you to do so – and thanks for that effort. Shaking my head at the amateurs on forum threads lecturing real-life railroad pros with decades of pertinent experience. The topic as I write is Signaling, which is something many modelers think that they understand, but don’t. And yet they prattle on and on, trying to justify the incorrect position they took at the outset with ever-more outrageous digressions from reality. My advice (which would only be ignored) would be to stop digging, take the “L”, and value the opportunity to learn from generous experts. I recently read Dr. Tom Nichols’ book The Death of Expertise, an exploration of how uninformed people believe that they know more than bona fide practitioners. A key quote: “Americans have reached a point where ignorance … is an actual virtue.” As Isaac Asimov also told us – and as is on display every day in Internet forums. 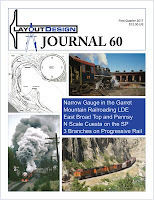 Sorry for the delay in distributing Layout Design Journal #62. New membership volunteers in the Layout Design SIG are working hard to get up to speed. Most members who choose paper delivery will have received their issue by now. On-line delivery emails are going out right now. 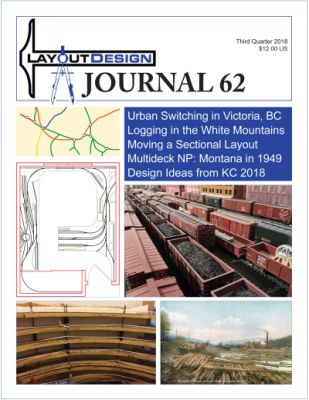 This issue includes: Switching challenge 10X11 HO layout features urban switching and RDCs on the Esquimalt & Nanaimo. Bonus-room HO multideck layout modeling White Mountain, NH logging. Moving and rebuilding a large HO Midwest-themed sectional layout. Conceptual design for N scale multideck Northern Pacific in Montana in 1949. Ideas from Kansas City 2018 Tours. LDSIG News and Announcements. 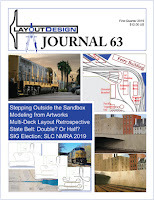 To download a free “Sampler” of a few pages of LDJ-62 and other recent issues, visit this link. We are now working on LDJ-63 and hope to distribute it in January; so renew soon if your membership is expiring. To begin or renew your LDSIG membership, visit this link. It’s been a crazy year or so, with lots of family medical issues and other challenges -- in other words, life! But as things return to normal, I hope to be posting here more often. One area where I’m catching up is my work editing the Layout Design SIG’s Layout Design Journal. After a long delay, LDJ-61 is in the mail. Although I did not set out to structure the magazine this way, this issue ended up with a major focus on switching layouts. 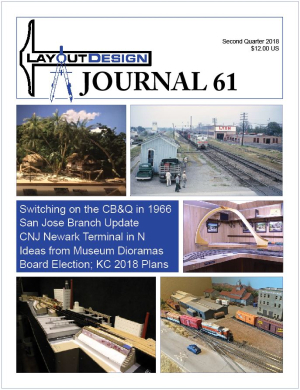 A detailed design story covers Jonathan Jones’ N-scale Central New Jersey Newark layout featuring innovative modeling techniques, lighting, and construction. A 10X11 HO layout previews the designer’s large future home layout featuring Chicago, Burlington & Quincy switching in 1966. There’s an update on a nifty Western Pacific prototype-based San Jose, CA N-scale sectional switching layout -- very interesting to me as it’s my own back yard and a favorite prototype. Another article suggests lessons on model railroad scenery perspectives from museum diorama builders. A photo essay on movable benchwork ideas for gates and elevators from Orlando 2017 rounds out the issue. Click here to join the LDSIG and start receiving the LDJ in print or as an on-line download. 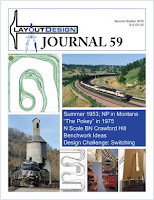 Layout Design Journal authors and volunteers have produced another excellent magazine. 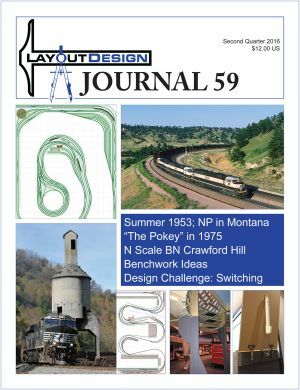 LDJ-60 includes: Don Mitchell’s design for an Sn3 Denver, South Park, & Pacific layout in a challenging garret space. Wind River Canyon Layout Design Element in N scale. Two multideck 16’X22’ Mountain Challenge articles: HO East Broad Top and Pennsy; Southern Pacific’s 1950s Cuesta Grade in N scale. Three Progressive Rail branches in 10’X11’ Switching Challenge space. LDSIG news and announcements. Click this link to download a free sampler of a few pages of LDJ-60. A new word for the day: Implausintransigence. That’s the act of asking a question on an Internet forum and then steadfastly refusing to be swayed by factual answers that are contrary to whatever crazy thing the questioner wanted to do in the first place. Bottom line, your railroad, your rules – do whatever you like and save everyone the trouble. Why waste your time arguing with people making the effort to provide you with facts that you're going to ignore anyway? SMH, as the cool kids say. 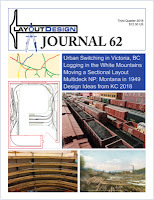 A new layout design challenge was published in LDJ-59 -- anyone may submit a plan and a story for possible publishing in a future Layout Design Journal. The concept this time around is to design a layout focused on switching operation for a roughly 10’X11’ space (with some obstructions). 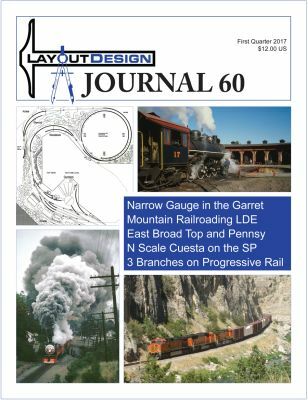 Speaking of LDJ-59, it includes some clever responses to our earlier design challenge, which focused on mountain railroading in a bonus room. The three 16’X22’ Mountain Challenge articles were: HO Northern Pacific focused on 1953 passenger schedule and informed by John Armstrong design principles; three HO multideck track plans for Norfolk and Western 1970s Pocahontas Division with intermediate climbing decks; N scale Burlington Northern Crawford Hill. And more! Click here to download free “Samplers” of a few pages of LDJ-59 and other issues in Adobe Acrobat format. Click here to begin or renew your Layout Design SIG membership. Each membership cycle includes four issues of the LDJ.